This easy homemade enchilada sauce is packed with authentic Mexican flavors! Skip the store-bought sauce because this recipe is ready in under 15 minutes and can be made ahead of time for quick meal prep. Homemade enchilada sauce is a versatile condiment that can add a burst of authentic Mexican flavors to any dish. If you’re used to popping open a can of red enchilada sauce, once you try this recipe you will never go back. The store-bought version lacks the robust flavors of a freshly made sauce because it’s been sitting on the shelf and the spices mellow out over time. Instead, a combination of crushed ripe tomato sauce, garlic, chipotle peppers and generous amounts of savory and spicy seasonings maximize the flavor. The sauce is ready in under 15 minutes and can also be made in a more substantial batch and froze to make mealtime fast and easy! 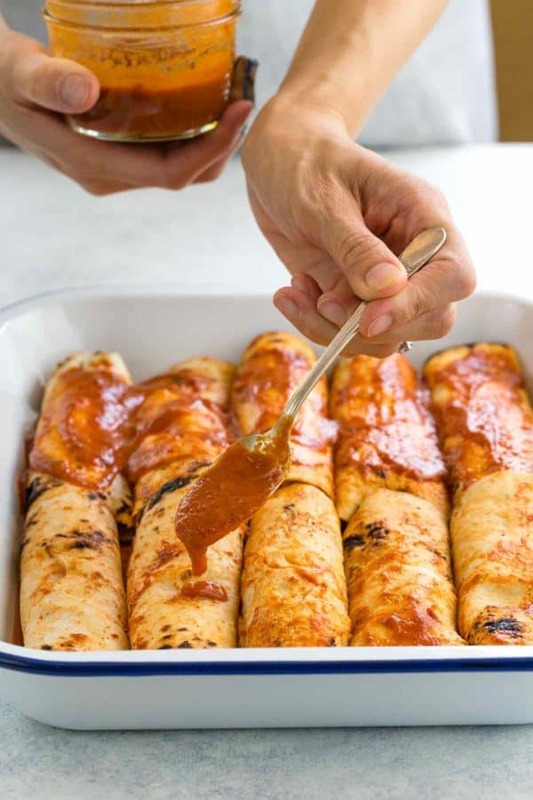 There are different ways to make enchilada sauce. Some recipes use dried poblano peppers, tomato sauce, and flour. To add instant deep smoky chili flavor and richness, I use a winning combination of simple ingredients to maximize the sauce’s flavor. Crushed Tomatoes: A more pulpy yet smooth sauce to add thickness to the sauce without flour, and makes it gluten-free. This is the base of a red enchilada sauce. I prefer to use San Marzano canned crushed tomatoes because they have the sweetest, balanced flavor. Chipotle Chili Peppers: The canned chili peppers in adobo sauce are smoke-dried jalapenos, and pack an intense flavor. They have a subtle sweetness and a nice heat, but nothing that can’t be tolerated. Add more if you want a stronger smoky flavor. It’s a quick and easy way to add traditional Mexican flavors to a recipe. Spices and Seasonings: Minced garlic gets infused in the olive oil to give the sauce a fresh earthy aroma. Dried seasonings like cumin, chipotle chili powder and chili powder all add savory notes. Then if you want to make the enchilada sauce spicier, gradually increase the amount of chipotle chili powder. Stock: Chicken or vegetable stock is used in this the sauce to add some viscosity. This sauce is a little thickener than the canned version because I prefer how it clings to the surface of the tortillas instead of becoming a pool of thin liquid in the baking dish. However, the thickness of the sauce can be easily adjusted with more stock if desired. Garlic is first sauteed in olive oil until fragrant for about 30 seconds to boost the flavor of the enchilada sauce. The dried cumin, chipotle chili powder, and chili powder are briefly cooked in the oil to bloom the spices. Whole chipotle peppers are then briefly cooked and broken down with a spoon before simmering. The crushed tomatoes, chicken stock, and salt are then added and simmered for about 5 minutes to infuse the flavors together. In a blender or food processor, the cooked enchilada sauce is mixed for about 30 seconds until smooth with some tomato particles remaining to help break down the chipotle chili peppers. You don’t want the sauce to become too thin. This recipe makes about 2 cups of enchilada sauce. It’s perfect for one tray of shredded chicken enchiladas, about ten servings. The sauce can also be made ahead of time and stored in a jar or air-tight container for up to a week, or frozen and defrosted when ready to use. Taco bowls: Toss your choice of protein with the sauce for Mexican recipe. Taco Sauce: Stir the enchilada sauce into ground beef, chicken or turkey for quick tacos. Add hot sauce to make it spicier and add some tang. Wet Burritos: Smother on top of a burrito, top with cheese and melt. One of my favorite ways to order Mexican food! Huevos Rancheros: Fry up some over easy eggs and add some sauce on top with a crispy tostada or tortilla. Slow Cooker: Add chicken or pork shoulder along with the sauce, and cook until the meat is tender. Dips: Mix the enchilada sauce with some sour cream, greek yogurt or a little bit cream cheese for a quick appetizer to serve with chicken, vegetables, or tortilla chips. Casserole: Top vegetable, pork or chicken enchiladas, or layer vegetables or tortillas to make a lasagna or casserole. To bring dried spices to life in a sauce is to bloom them briefly in oil. This allows the fat-soluble flavor compound in the spices to be released into the oil to flavor the sauce. Blooming the spices also enhances the aromatic compounds to make the sauce smell and taste better. In a medium saucepan add olive oil. Heat over medium heat, once hot add the garlic and saute for 30 seconds. Add the cumin, black pepper, chili powder, and chipotle chili powder, stir to combine and cook for 30 seconds. Add the chipotle chilis and use a spoon to stir and break up into smaller pieces, cook 1 minute. Add the chicken stock, crushed tomatoes, and salt, stir to combine. Bring sauce to a boil and then reduce to a simmer until sauce is thickened about 5 minutes. Transfer enchilada sauce to a blender or food processor and process on medium speed until smooth, about 30 seconds. Taste sauce and season with more salt and pepper as needed. More chicken broth can be added to thin the sauce if desired. Use on proteins, enchiladas or store in an airtight container for up to 7 days in the refrigerator. MAKE IT VEGETARIAN: Substitute chicken stock for vegetable stock. Some of the links above are affiliate links, which pay me a small commission for my referral at no extra cost to you! Thank you for your feedback Susan! Great idea to freeze the sauce. Jessica, I love your recipes! Your menus/instructions are easy to follow. I just found your homemade enchilada sauce, it sounds & looks delicious & I am going to make it soon. Thank you.